In last few articles we discussed some basic design aspects of electric transmission lines. Sometimes the discussion about a certain part was very brief considering that the same can be elaborated more somewhere else. Effort is made to flash the important points or parts of the subject. In the previous 3/4 articles we developed some concepts on AC transmission line parameters and discussed how the line parameters can be calculated under different configuration of phase conductors. The behavior of transmission lines and its voltage and current under normal and abnormal conditions depends on these parameters. For carrying out system studies the proper modelling of transmission lines is very important. Here in this article we discuss the transmission line modeling . Transmission lines are also called as power lines. 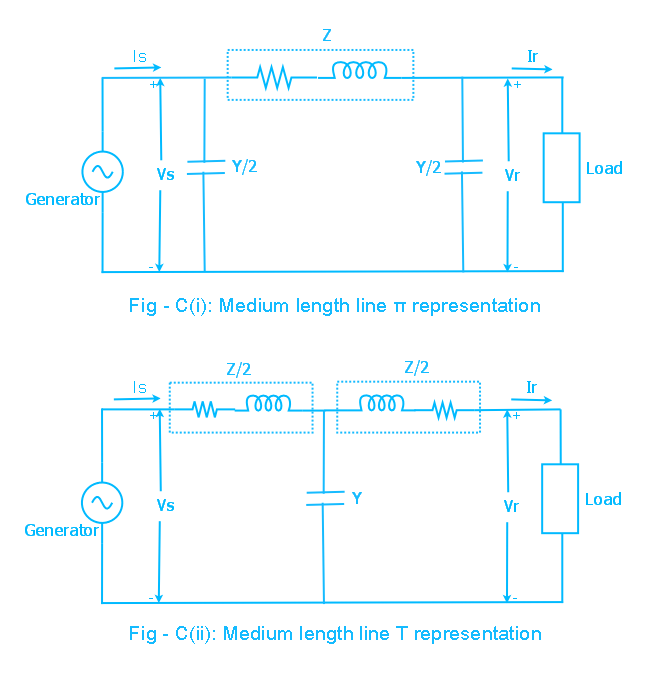 Transmission line theory is important for both power and electronics or communication engineering. But here our discussion is mainly from the power engineering point of view. The transmission lines are mainly classified as short, medium or long lines. The classification is based upon the accuracy of the model and simplicity. While the short line model is quite simple, the long line model is somewhat complex and the medium line is in-between the two. At power frequency of 60 or 50 Hz, the lines of length below 80 km are treated as short lines and the length of line exceeding 80 km but less than 250 km can be modeled as medium lines and as the length of lines exceed 250 km it is long line. For short and medium length lines the parameters are lumped. This simplifies the model and gives quite accurate result. 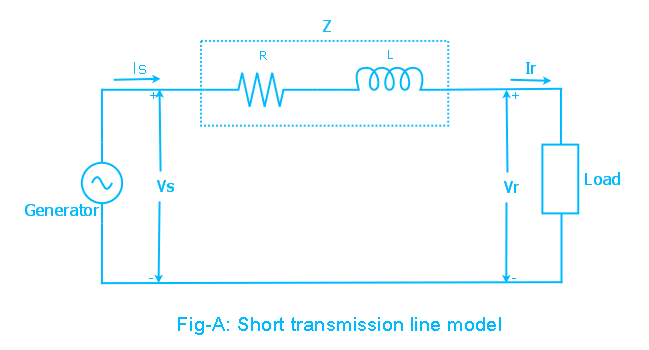 In case of the long transmission lines the line parameters are considered as distributed along the length of the line. 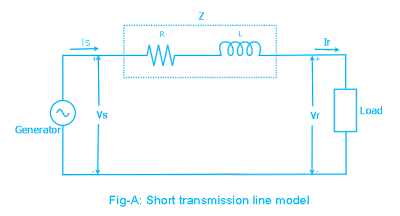 The aim of the transmission line model is that it should be simple and the analysis of the model should bear desired accuracy. Of course you can apply the long line theory for power lines of length below 80 km. Doing so one can achieve somewhat more accurate result (which may not be desired) while making the model or calculation more complex. Here in this article we will discuss short and medium length lines only and long line is the topic of the next article. Before proceeding further, as we already discussed in our previous articles there are four line parameters, these are line resistance R , inductance L, leakage conductance G and line to neutral capacitance C per meter length of line. Here instead of using the symbol Cn as the capacitance between line and neutral we will adopt C.
Here we will use these. As already discussed in our previous article G arises due to leakage currents and is ignored in transmission line modelling. where l is the total length of the line in meter. As already said the lines of below 80 km length can be modeled as short lines. The transmission line is a three phase system and here assumed as balanced due to transposition and balanced load at receiving end. The analysis adopted here can be applied to unbalanced non-transposed systems for obtaining result with reasonable accuracy. For the balanced three phase line we are only required to analyze one phase. The return path is imaginary neutral. In Fig-A is shown a short transmission line. The resistance and inductance are lumped together which is the transmission line serie impedance Z. Further for short line here the capacitance of the line is ignored so the admittance is ignored. As shown the sending end and receiving end voltages are Vs and Vr respectively and the sending end and receiving end currents are Is and Ir respectively. R is the total line resistance and XL is the total line inductance, both are lumped. In the above formulas A and D are dimension less. Dimension of B is Ohm and that of C is Siemens. 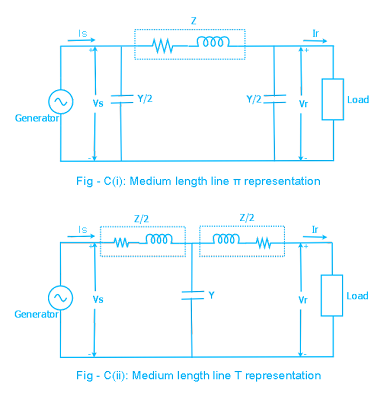 In transmission line problem this representation is sometimes found suitable. Usually the receiving side voltage and current requirement are given and it is required to find the supply side voltage and current. The performance of a transmission line is determined by a term called voltage regulation. Voltage regulation is defined as the percentage change in voltage at the receiving end from No load to Full load with sending end voltage held constant. or means the values or magnitudes of voltages without sign . So the subtraction is the simple subtraction and not the phasor subtraction. The voltage regulation is desired to be small or zero. Integrated Grids has set standards for voltage variation say ±5% or ±7% depending on voltage levels. The relationship Vs = Vr + Z Ir between the sending end and receiving end voltages can also be illustrated by a phasor diagram shown in Fig-B. In Fig-B(i) we have considered an inductive load. So the receiving end current Ir lags the receiving end voltage Vr by a phase angle φ(determined by load). In Fig-B(ii) is considered a capacitive load. 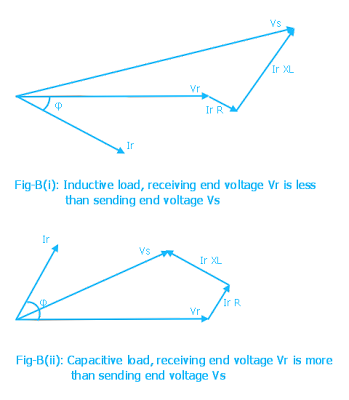 Here current Ir leads the voltage Vr by an angle φ. In both the diagrams Vr and Z Ir are added as per the rule of phasor addition. Z is the line impedance as discussed above. The main difference between the above two is that in case of lagging load the receiving end voltage is less than the sending end voltage. But in case of leading load the receiving end voltage can even become more than the sending end voltage depending on the lead phase angle φ . Which is due to the fact that the load is capacitive. In our case Fig-B (ii), for the chosen phase angle the receiving end voltage is more than the sending end voltage. Actually the industrial loads are mostly inductive. The inductive loads consume reactive power. Capacitors which generate reactive power are connected at the load end or at substations to supply reactive power. At sub-transmission and distribution levels where voltage drop is a problem, capacitors can improve the voltage profile and power factor at the receiving end. The capacitive load helps in improving the receiving end voltage regulation and power factor. For only voltage regulation purpose usually tap changer of transformer is utilized. By tap changing the transformer turns ratio is changed, so adjusting the secondary voltage. Another common definition which sometimes may be useful for evaluation of transmission line performance is the transmission efficiency of the line. The transmission efficiency is defined as the ratio of power delivered at receiving end to the power supplied at sending end. cos φ is the power factor at the receiving end, or power factor of load but cos φs is the power factor at the sending end (due to both load and transmission line). Using the above formula it is easy to find the transmission efficiency of short and medium lines. For short line the angle φs is clearly visible from the phasor diagram (angle between Vs and Is (or Ir)). But in case of medium line little more effort is required. The medium length lines are categorized as transmission lines of more than 80 km and less than 250 km length. The medium length lines can be modeled two ways. These are nominal π and nomial T (Fig-C), so named due to the arrangement of elements. Due to the length of the line admittance Y is no more neglected. Of course in both the π and nomial T representations lumped elements are used. In the nominal π representation the total admittance due to line capacitance is equally divided into two halves and each half connected at both sending and receiving ends. In the nominal T representation the admittance is connected at the center of line and line impedance is divided into two equal parts and each part is connected on both sides in series (Fig-C). It can be shown that for the π representation the sending end voltage and current can be written in terms of receiving end voltage and current as shown below. From above two expressions ABCD parameters can be easily identified. Also you should verify the condition AD-BC=1. For T representation also applying KCL and KVL we can obtain the similar expression for Vs and Is. At no load putting Ir = 0 we obtain Vr NL = Vs / A, . Analysis of short and medium lines helps us gain important concepts of transmission lines. It is useful for long line analysis. This one article alone shows off your excellent writing skills. Is there any smart people left in this universe? Do you have any additional articles on the same topic? Hi. I wanted to drop you a quick word to express my thanks. Ive been following your weblog for a month or so and have picked up a ton of excellent info and loved the tactic youve structured your site. I am trying to run my very own weblog nonetheless I believe its too normal and I need to deal with a lot of smaller topics. Being all things to all folks is not all that its cracked up to be. wo wo wooooah! this blog is very helpful and effective, i expand my knowledge in this field more. Great work! Why haven't we taken Vs as refrence in both nominal π and nominal T circuit? At receiving end there is not a suppy it is a load which is represented as supply.